We keep moving forward. I heard saying somewhere about boat building and it went something like: Building a boat is not a hard job, it's the fact that there are a million different jobs to do that make it difficult. I'm beginning to see how true that is. I have not encountered anything that is particularly difficult to do but my mind is always filled with the thought of all the jobs that need to be done. The only way to overcome this is to keep working on something, anything, just keep checking boxes off the list. We took the transom knee out of the clamps and laid our patterns for both knees out on them. I used a wide tipped marker to trace the patterns on to the blank knee lamination's for the stem and transom. Using the thick marker created a thick line to cut out. 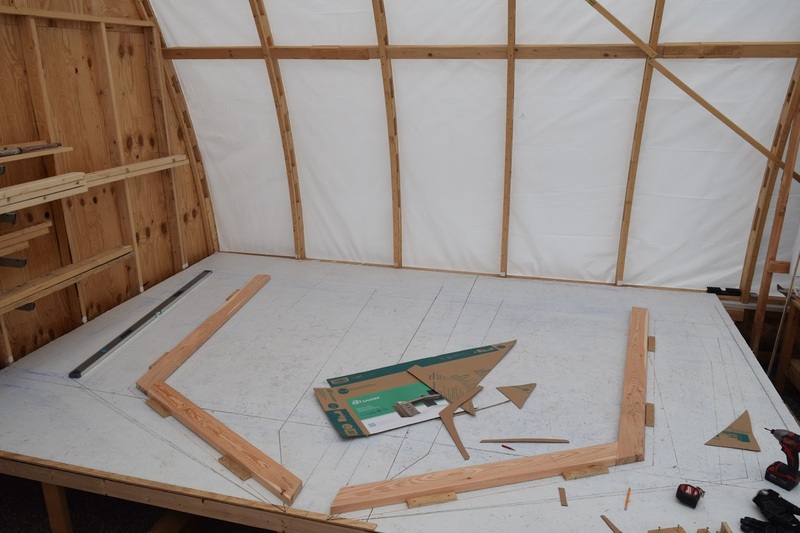 I cut out the outside of the line leaving the inner edge of the line for final fitting once the keel is ready to receive them. I was lucky to have a 10 1/4" timber saw to cut them out with. 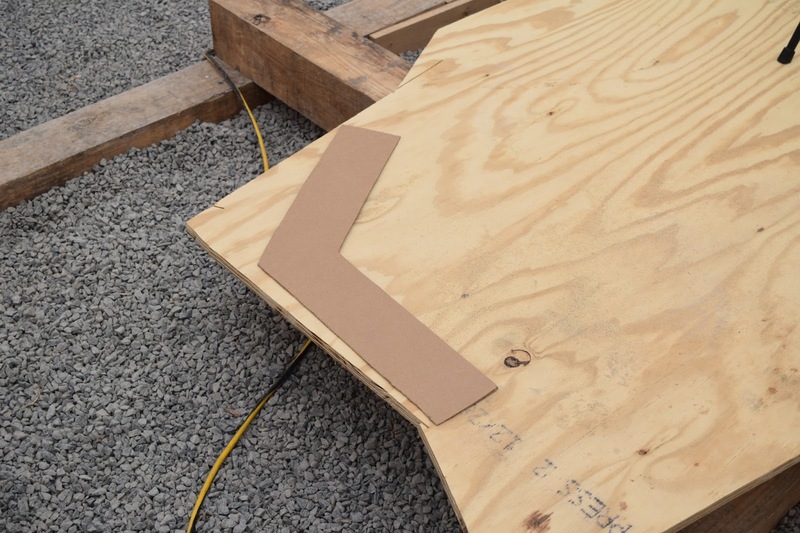 A standard 7 1/4" circular saw would not have enough depth to make the cut. As it was I had to mark the pattern on each side of the blanks and cut both sides in order to get through these 7" thick pieces. I thought about cutting them on my bandsaw but that proved to difficult. 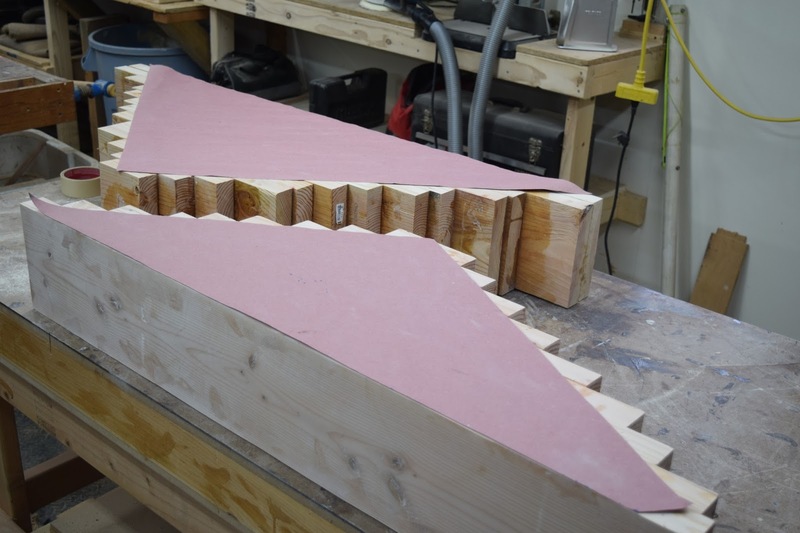 Not only are these knees quite large and heavy and difficult to manipulate on the bandsaw but the cutting would need to proceed very slowly. 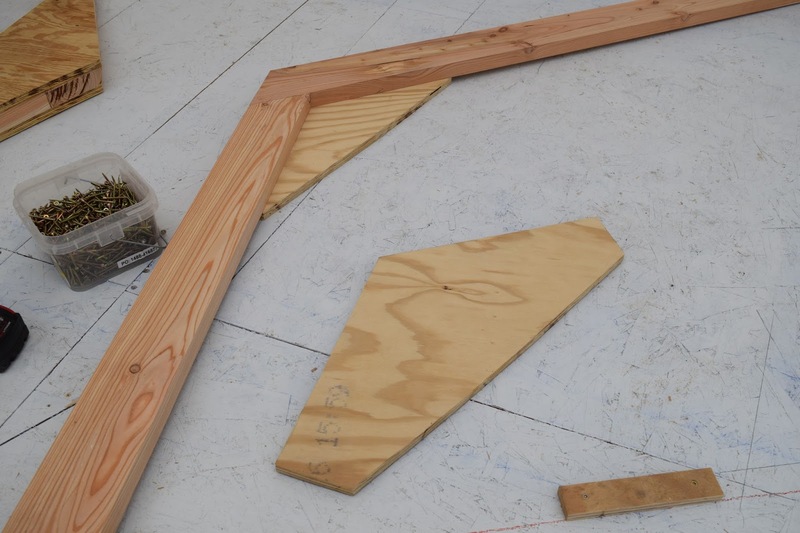 Now I hate when I watch a home show or a building show and the builder pulls out some obscure tool that no average woodworker or DIY enthusiast would own and uses it to make a job look easy. I was fortunate to have been given this timber saw by a retired construction worker friend of my fathers. If you are attempting something similar you could use a chainsaw or rent a timber saw from a tool rental place. These saws are big, powerful and have a ton of torque so they take some getting use to. I've only used this saw a couple of times but I was basically familiar with how it feels when cutting. If you end up using one I would recommend a few practice cuts before getting started. Once that job was completed we moved out to the boat shed to build another frame. This time it was for station 10. 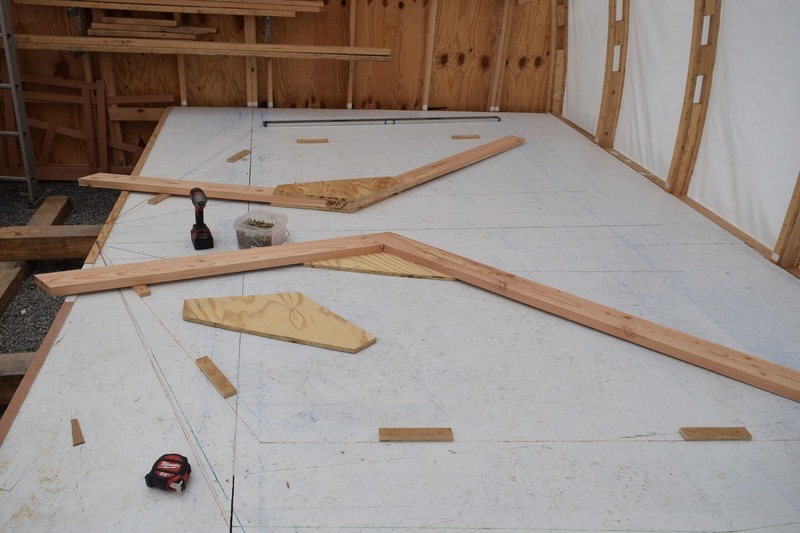 We installed our spacer blocks on the lines we lofted out on our framing table to account for the thickness of the hull planking. Just like station 2, we laid out our timbers, marked our lines and cut out the angles. I again used cardboard to create a pattern for the gussets and cut them from 3/4" ACX plywood. 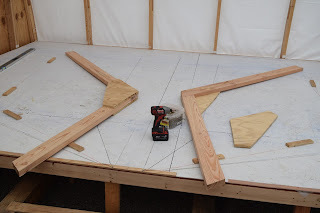 I cut my patterns exactly in the shape of the joint and add the shoulder of the gusset once I lay out the pattern on the plywood. I just use a straight edge to connect the inside corners of the pattern. You can check out our building videos on YouTube to see a better illustration of the process. Station 10 still has a relatively steep bevel angle but I was able to use the same pattern for both sides of the frame. 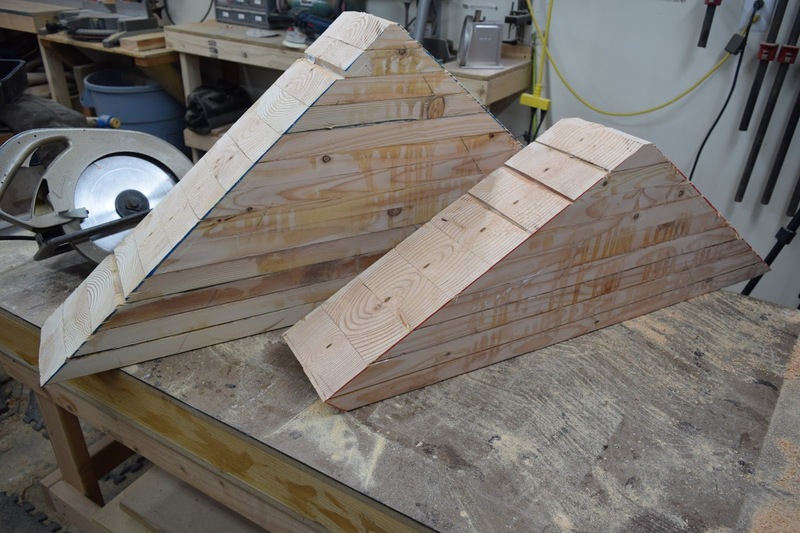 Just like station 2, we screwed the gussets to the timbers to temporarily hold them together until we are ready for glue and bolts. It takes about an hour to machine up and cut all the bevels on the timbers and then it takes about an hour to complete the assembly process. The work went pretty smoothly this time and as other readers and viewers have said, the process is speeding up as I become more familiar with what is required. I was grateful to pick up an overtime shift this weekend so I only had one weekend day to work but I think I made the most of it. As more and more friends and family find out about the project I'm getting use to the strange looks and offers for psychological help. Every once and a while I do have moments of panic thinking about what I have gotten myself into, but It really has been an enjoyable process so far. I look forward to my time in the shop all week long and so far I have no regrets. Thanks for following along and we love to hear from our readers and viewers so don't hesitate to send us a message using the link above. If you prefer you can email us at contact@seadreamerproject.com or leave a comment here or on YouTube. Hopefully we can bang out a couple more stations this weekend and get ready to loft out more stations.